Rain brings yellow flowers to brighten the rare brush-pea. As a botanist, I don’t love only the big, showy megaflora species. I love them all: the ambitious weeds, the unearthly looking spurges and the modest grasses. Even a brush-pea (Genistidium dumosum) — a small, leafless bush much of the year — makes it into my circle of friends. 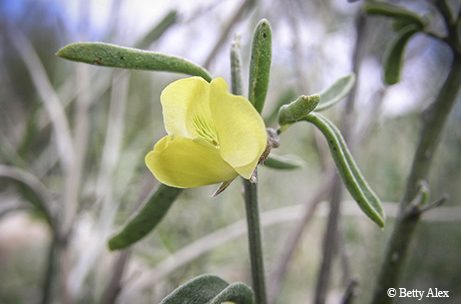 A rare esoteric legume, the brush-pea lives in the limestone hills of southwestern Brewster County. This portion of Big Bend country has blindingly bright limestone hills with steep, rocky slopes. Only aoudads are sure-footed enough to carve trails across the hills, but the tricky paths can be followed by scrambling botanists. The little vegetation that occurs in this northernmost outpost of the Chihuahuan Desert is dominated by creosote and the unforgiving “shin-daggers,” or lechuguilla. In fact, most of the vegetation available to grasp is dangerously unforgiving (catclaw, strawberry cactus, ocotillo, prickly pear and Spanish dagger). It takes some skill to keep upright on the trail and simultaneously look out for brush-pea, rattlesnakes and the occasional abandoned quicksilver mine. Brush-pea surveys are complicated by the plant’s drought-deciduous nature. As implied, these plants drop their leaves during periods of drought, a common occurrence in an area that receives only 12 inches of rain per year on average. During wetter times, the plant features yellow pea-like flowers and produces inch-long beans. However, during droughts, the plant resembles a witch’s broom: no leaves, no flowers, no fruit. Tripping over brush-pea is probably the most effective way to locate this plant. Working with rare plants requires a love of plants, but also patience. For every site where a rare species is found, there will be another 10 or more that disappoint. Of course, this makes sense: how else would we recognize rarity? Though found in Mexico, only one brush-pea population is known in the United States. TPWD has spearheaded additional searches in Brewster County in recent years. Thanks to the cooperation of private landowners, one population last seen in 1990 has recently been rediscovered. Thirty leafless, flowerless plants were found in April, doubling the current number of plants in the state. Sometimes it pays to follow the way of the aoudad.